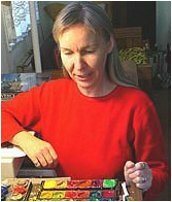 Lucette once said: "The closest analogy to how I experience both the act of painting and a finished work of art is music. While I am painting I feel like music is streaming through me on to the paper. It is difficult to say whether I am playing the music or the instrument being played. My experience is the reverse of music however, because the performance is done privately in my studio while the completed score in its entirety is what I show the public. There is another interesting distinction between the two mediums for me as well. Music is played in a line, it is linear, but it creates an atmosphere that continues after it has been played. A painting is a whole piece of music sounding all at once and which the viewer replays by looking at it. As the eye wanders around a painting the colors, forms, textures and their relationships are "sounding" within the viewer creating an experience or mood or atmosphere." Lucette passed away in February of 2011, but her unique perspective on music and art lives on. Earth Mantra is very proud to have brought Lucette's music to our listeners and to have helped ensure that her music continues to inspire for many, many years to come.